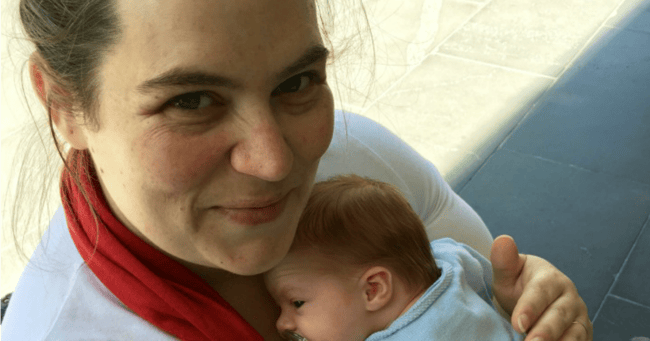 Mamamia's parenting editor tells her VBAC birth story. "I had a vaginal birth after a caesarean and in a weird way I loved every moment of it." For many mothers, a caesarean birth marks the beginning of a run of caesarean sections for subsequent children. But it doesn’t have to be that way. If it’s medically safe and if it’s your choice to have one, a vaginal birth after caesarean, commonly called a VBAC, is a remarkable experience. Our parenting editor, Alys Gagnon, shares her VBAC birth story. It was my girlfriend’s pain-free water birth that sparked my curiosity. My son had been born breech in an operating theatre by a routine elective caesarean section. It was a positive and joyful experience, one I’m glad I had. William stayed resolutely heads up in my womb from about 31 weeks, refusing all the prompting I gave him to turn; hand stands in the pool, lying in bed with my bum propped up underneath every cushion I could find, acupuncture. The acupuncturist swore a 100 per cent success rate, but William defied her. He’s five years old now, and defies authority on a semi-regular basis so I’m not so surprised he was determined to do things his way. William was born two days past his due date, but despite that I didn’t even have Braxton-Hicks contractions. I had no frame of reference for labour and delivery at all, save a couple of girlfriends assuring me that it hurt like hell. So, when my dear friend told me that despite three days of pre-labour, and about 15 hours of active labour before giving birth to her daughter in a bath at a Canberra birth centre she experienced no pain my interest was piqued. I knew even before falling pregnant that I wanted to have a crack at labour. What is it really like to give birth? Post continues after video. When I did eventually fall pregnant with my daughter I floated a natural birth with the staff at my hospital during my first trimester. They told me it was my choice and that they would support me either way. One of the things you hear when you’re pregnant is that second and subsequent births are often quicker than the first. But what I didn’t realise was that despite the fact that this was my second pregnancy, as far as my body was concerned it was my first. I woke up on a Tuesday morning to some spotting. That evening I went in to hospital be checked. I was a centimetre dilated. One. Centimetre. It won’t surprise anyone to learn that I spent the night back at home in my own bed. On Wednesday I went back to the hospital for monitoring – ECG, blood pressure etc. One of the obstetricians suggested they weren’t comfortable to leave me having irregular contractions for longer than 24 hours or so. She invited me back the next day to have my waters broken. By this stage I was pretty over the whole thing. I wanted the baby out. I literally high-fived the doctor at the prospect. By 9am on Thursday I was settled into my delivery suite with a crochet hook up my clacker having my waters broken. The obstetrician doing the procedure wasn’t able to get a scalp node attached to my daughter’s head at the time – I was still only one centimetre. The staff were keen for the baby to be constantly monitored, so that meant until they could get a scalp node on the baby I had to wear an ECG, and that meant I was pretty well confined to bed, and that meant that while I was having contractions, I wasn’t really in active labour. Alys&apos; daughter, Claire, not long after she was born (left) and at 14 months (right) Images supplied. At midday though, and at three centimetres, the obstetrician got a scalp node on my daughter and I could get out of bed. Which is when things started to get interesting. I&apos;m still completely mystified watching the US version of One Born Every Minute. So many birthing mothers hanging out in bed. Being upright and active helped me get things moving so much. At 3pm I was four centimetres. I didn&apos;t ever really have a formal birth plan - I figured mostly I would just let my body do what it needed to do, and just try and joke my way through the difficult stuff. And joke I did. I joked and laughed and talked. After a while I started on the gas and air, and kept joking and laughing and talking as best I could. The only thing I asked for before I went into labour was a simple request of my husband. I figured at some point I would ask for an epidural but I when I first raised it, I asked him to push me a little further to see how far I could get through labour on my own. It was 5pm when I started to say to my husband that I thought I needed an epidural. The obstetrician was coming to check me at 6pm and he pushed me to hold out until then. Alys and Claire at five weeks, sleeping like a baby. Image supplied. At 6pm I was six centimetres. I could have cried from disappointment. I was down to thirty seconds between contractions and six centimetres sounded like hours away from relief. I had run out of jokes and instead I begged and cried for the epidural. Around 7pm the anaesthetist arrived. She talked me through the risks of an epidural and got everything ready. About half an hour later I went to the loo for my last wee before the catheter and epidural. All of a sudden, something in my body changed. The contractions shifted their force and my body took on a mind of its own. I shouted, "Oh my god, I have to do a poooooooooo!!" I swear, about 358 people ran in to pull me off the toilet and they were all shouting, "NOOOOOOOO!" I didn&apos;t realise it at the time, but it wasn&apos;t poo my body wanted to push out! Alys and Claire on Claire&apos;s first birthday. Image supplied. I&apos;m not sure how many people checked me once they got me out of the bathroom and onto the bed, but I was 10 centimetres and apparently ready to go. The anaesthetist walked quietly away, taking my epidural with her. 35 minutes later, and after shouting and yelling and lamenting the fact that I didn&apos;t book this one in for another caesarean, Claire was born. She was a tiny little thing, 2.74 kilos and a she had a mop of auburn hair. The relief was immediate. The joy was profound. And my sense of feminine achievement was solid. And, importantly, my curiosity about labour had been satisfied. It wasn&apos;t the pain free water birth that my girlfriend had experienced, but it was an experience that I look back on and think: "God, in a weird way I loved every moment of that."